There was a lot of confusion on the Maggi issue, and Times of India was one of the players. On 7th June, Times of India said that Maggi would not be banned in Karnataka, following a test in a private lab, authorized by the Government. Curiously, on the same day, The Hindu ran a story which said the opposite. The Hindu claimed that Maggi would indeed be banned in Karnataka. By 19th June, finally Times of India got its act right and reported that Karnataka Government had ordered Nestle to burn its Maggi stock. A Clarification: MoD has NOT issued any photo relating to Indian Army action along Indo-Myanmar border in the North East, so far. Editor of ANI news Smita Prakash claimed that the picture was “authorised to be released”, but at the end of the day, the fact remains this was an old picture and had no connection with the Myanmar ambush, yet was shown as such by the media. Firstly, Parrikar was speaking in the context of State Governments not giving due importance to needs and requests of the Defence Forces. Secondly, Parrikar clearly says “I don’t mean to say that we should go to war“, before saying that Army’s importance has diminished. Yet, he was painted as a warmongerer by the media, and hence he has recently taken the decision to avoid the media. Indian Express declared that the IIT JEE advanced topper was a “girl” named Satvat Jagwani. This, even as other news reports claimed Satvat Jagwani was a boy. Eventually it was clear that Indian Express had yet again goofed up. Later Indian Express rectified the story and hence we do not have a screenshot of the original news story. But there is adequate information to support the claim that Indian Express messed up. This user tweeted about the same, and even in the comments section of the Indian Express piece, a reader has asked Indian Express to change the story URL from “girl” to “boy”.
. @nitingarg456 The headline & content of the story surprise me. Both my TL & @CimGOI have recorded our participation. Pl check. On reading this headline, one would imagine AIMPLB has asked Muslims to begin hostile activities against Hindutva. But once we read the article we find something different. The problem here is Firstpost has tried to sensationalize the issue by adding a “call to arms” phrase, which generally means calling people to take up hostile or military activities. The truth however, is that AIMPLB merely asked to start a campaign to spread their views, and not any violent activity. This is evident when one reads the quoted text in the article. There are some errors in the statement. Firstly Europe is technically not a country. But Modi visited only France and Germany in that trip. So that makes 5 countries. Also, Modi has visited 20 countries till date. So Adani’s self-confessed score is 5/20, hardly “constant”. Even the Hindustan Times article states that Adani has been to United States, Australia, Brazil, France, Canada and Japan (Brazil & Canada not mentioned by Adani). Even if we go by Hindustan Times’ count, Adani scores just 6/20. Does that qualify to be called a “constant companion”? We had written a separate post on this, detailing how Economic Times put up various versions of this story, all denied by Rahul Yadav himself, and also the obvious conflict of interest between which exists since Times Group owns a company which is Housing.com’s rival. Times Group and Rahul Yadav have a history of being at each other, possibly for such reasons alone. In order to maintain a particular slant, Indian Express chose to post this story without asking the NIA their version at all. Thus many claims made in the article have turned out to be inaccurate. We had written a separate post on the same here. Firstly, while Salian claims she wants to ask NIA to be relieved from her duty, she has already been recommended to be dropped as a prosecutor, almost 10 days before her interview. Secondly, she hasn’t been “sidelined” in the process, but rules have been followed which says at initial stages, a junior officer handles the case. the case would go to the prosecutor, only at trial stage. 12. 27 June 2015: ABP News – Vasundhara Raje Liplock with Kiran Mazumdar Shaw. This, even though Economic Times, which had originally published the photo way back in 2006, had then itself issued a clarification that ” It was bad camera angle that gives the impression of a kiss on the lip, in what is just a friendly embrace”. Even then, the clarification was given only because TV channels had gone crazy using titles like “Maharani Ka Chumban” and ‘Shahi Kiss’ for this picture. The video is now deleted from the site. 13. 27 June 2015: NDTV – Lalit Modi used Sushma Swaraj’s help to go globe trotting. 2. Jain also forgot to mention that within a month of such “help” from Swaraj, the Delhi High Court too offered greater “help” to Lalit Modi, by giving him his passport back. So all of his trips post August 2014, could very well have been based on this passport. Why would he need travel papers when he has got his passport back? By deliberately hiding these two facts, Sreenivasan Jain in effect lied on his show “Truth vs Hype” that Sushma Swaraj allowed Modi to go globetrotting. 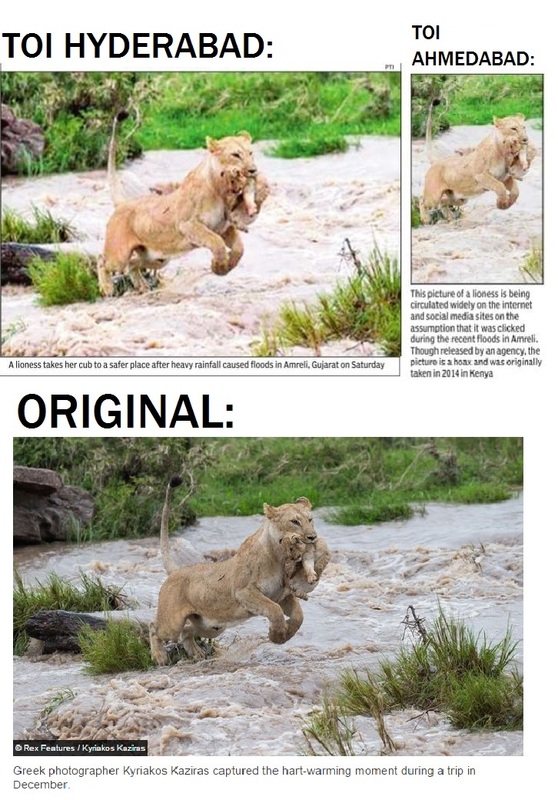 Times of India, in some of its print editions, carried a picture of a Lioness jumping over water, with her cub held in her mouth. The image was credited to PTI. Times of India claimed that this was a picture from the flash floods at Gir. The truth however, is that picture was from 2014, shot in Kenya, with credits given to “Rex Features”. Greek photographer Kyriakos Kaziras captured moment during a trip in December 2013. Even more amazingly, Times of India Ahmedabad, printed the same photo and set the record straight that the picture was actually from Kenya. 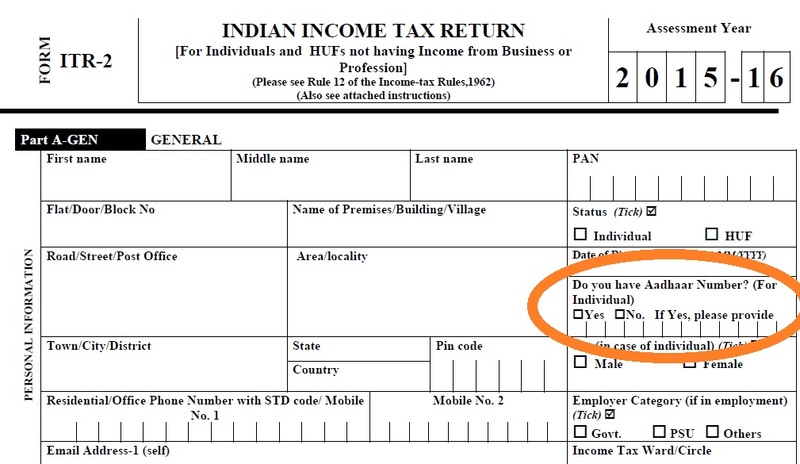 So comically, Times of India Ahmedabad knew, what many other offices of Times of India had no idea about? We had tweeted this out with all the discrepancies here. DNA’s headline said the maid was murdered “at” Shripad Naik’s house. The body of the same article said, she was murdered “near” Shripad Naik’s house. The fact was that she was actually murdered in her own hut, which was located near Shripad Naik’s house. This was clearly reported by Times of India who had a local reporter, unlike DNA, which relied on a PTI story. DNA later accepted the mistake and corrected the headline. 16. 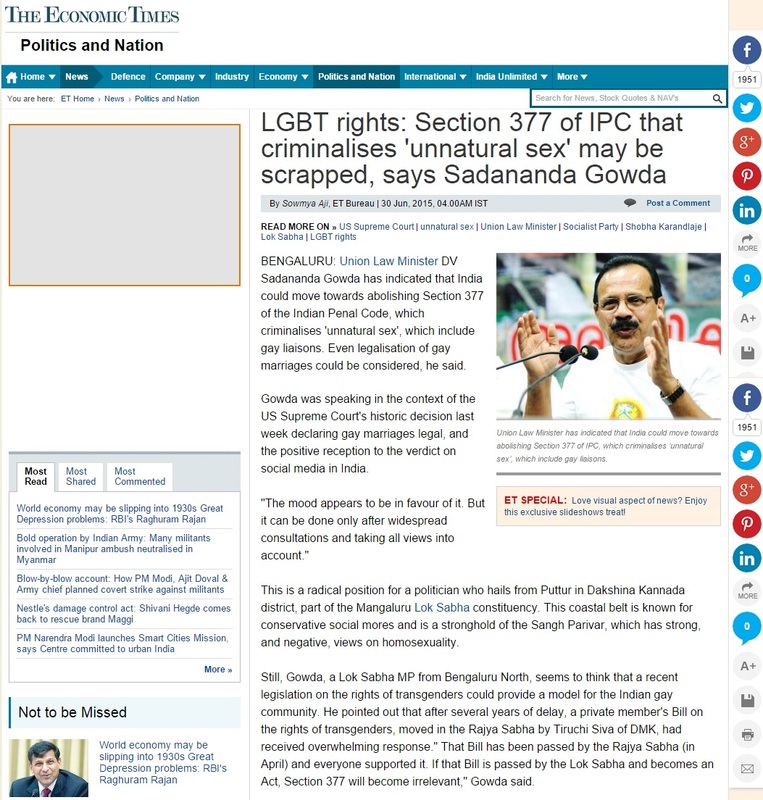 29 June 2015: Economic Times – Section 377 may be scrapped says Sadanand Gowda. Even on twitter, he repeatedly asked Economic Times to take down the report, which the eventually did. They gave the impressions that an Aam Aadmi’s family, was “holidaying” in “the world’s most expensive place”. The truth came out later, from the executive editor of IndiaSamwad himself. He clarified that Sunita Kejriwal, “was on foriegn tour sponsored by Finance Ministry.” and that “40 IRS officers were selected for tour”. He also tweeted that her kids joined her later, and the cost of their tickets, was met from a loan taken by Mrs Kejriwal, on her PPF balance. Any report by any Times Group publication, on Housing.com is always dubious, because they have a conflict of interest, and a legal battle going on too, as we explained here. And to add to this, the story of Housing.com being sold also seems to be untrue. Especially when you see this email, sent by Housing.com CEO sent to his employees. Rahul Yadav is suggesting that since Times group is writing this this story, he is just playing around with media at large, by giving contradictory statements. Even the Economic Times story, Rahul Yadav is quoted to have said “Joke of the year” while responding to this story. There are multiple aspects in this story, which media might have gotten wrong. We had mentioned all of them here. While some matters arent yet clear, we surely know that Media lied when they said the 1 lakh electricity bill was of Arvind Kejriwal. Fact is, Kejriwal had converted part of his house into a “General Administration Department” for work related to CM’s office. Hence, he had fitted 2 separate meters, one for his residential area, and one for office area. Media reported bills of both these areas as one, and claimed that the bill was over Rs 1 lakh. Actually, as per data given out by AAP, the bill for the residential area averages to only around Rs 15000 per month, which is not too high considering it was summer. A Netherland based foreign donor agency STICHTING CORDAID has been placed under prior approval category on Aug 06, 2012. This donor was traced when the Standard Chartered Bank seeked clearance from the Government for a remittance to Caritas Internationalis. So, contrary to what DNA reported, the Donor was under scrutiny and not the recipient i.e. Caritas Internationalis. This was also reported by Business Standard. Further, this was confirmed by Caritas themselves through a press release of their own.